Having a baby is perhaps one of the most rewarding experiences that life has to offer. Unfortunately, transporting newborns—and for that matter, children of any age—can often prove to be quite difficult. Despite their best efforts, most parents still make a number of potentially fatal errors when it comes to the use of a car seat. Failing to research the seat in question, placing it in the wrong spot, using improper buckling techniques, and using the seat as a crib are all mistakes that should be avoided when possible. According to the Mayo Clinic, purchasing a car seat without first researching its history is perhaps one of the biggest mistakes that new parents can make. While buying a car seat was once something of a gamble, today there are a number of organizations devoted to evaluating the safety and effectiveness of these important pieces of equipment. When looking for a car seat, shoppers should be sure to read up and manufacturer and the safety rating of the seat in question. Talking with friends and family who have purchased car seats in the past can also be a great way to find a high quality product at an affordable price. 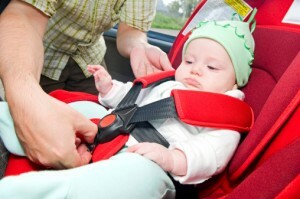 Placing the car seat in the wrong place in the car is another common mistake exhibited by many parents. According to most experts, infants and children who are riding in removal seats should always be placed in the back seat of a car, truck, or SUV. When possible, the seat should be placed in the middle of the bench, to avoid possible injury in the event of a side-impact car accident. When riding in the back seat is not an option, front seat airbags should be deactivated to avoid injury and possible death. Today, most men and women living in the United States recognize the importance of seatbelt use. While the use of standard seatbelts is considered by most individuals to be a no-brainer, this can become a challenge when securing a car seat. For best results when it comes to buckling a child into a car seat, parents should be sure to read the owners’ manual of the product in question. In most cases, movement should be limited to one inch in each direction to ensure safety during transportation. As suggested by the name, a car seat has one purpose—to serve as a safety device when transporting an infant or child. However, some parents use this tool for other purposes, such as a crib. Using a car seat as a crib cannot only cause confusion for the child in question, but may also lead to serious injury or accident. For more information on the dangers and hazards associated with the improper use of an infant or child’s car seat, parents should consider consultation with The Cochran Firm Wisconsin, LLC.